A lung cancer sample showing CD14-positive regions in green, CCR2-positive regions in red, and pan-cytokeratin in aqua. Credit: UNC's Translational Pathology Lab. University of North Carolina Lineberger Comprehensive Cancer Center researchers have found that by helping to form clots within tumors, immune cells that flock to a particular type of lung cancer are actually building a foundation for the tumor to spread within the body. In the journal Nature Communications, researchers report for a particular subset of lung cancer tumors, there is a high prevalence of immune cells called inflammatory monocytes. These immune cells, which normally help to build clotting scaffolds to promote wound healing, also make it possible for tumor cells to migrate and spread to other parts of the body. "The way that these immune cells promote lung cancer metastases was very unexpected. They produce a large amount of a factor that leads to clot in the tumor, which the tumor cells can latch onto and climb across to spread in the body," said UNC Lineberger's Chad Pecot, MD, assistant professor in the UNC School of Medicine Division of Hematology and Oncology and the study's corresponding author. "Our goal is to use this information to teach the cancer 'wounds' to heal themselves." Previous studies have classified lung squamous carcinoma—which accounts for about 30 percent of all lung cancers—into four different types based on their biological and molecular characteristics. In the new study, Pecot and his collaborators found that lung squamous carcinoma could be reclassified into just two different categories based on whether they showed a high presence of inflammatory monocytes. They used expression of the CD14 gene as a biomarker to show that high presence of this immune cell was linked to poor survival. 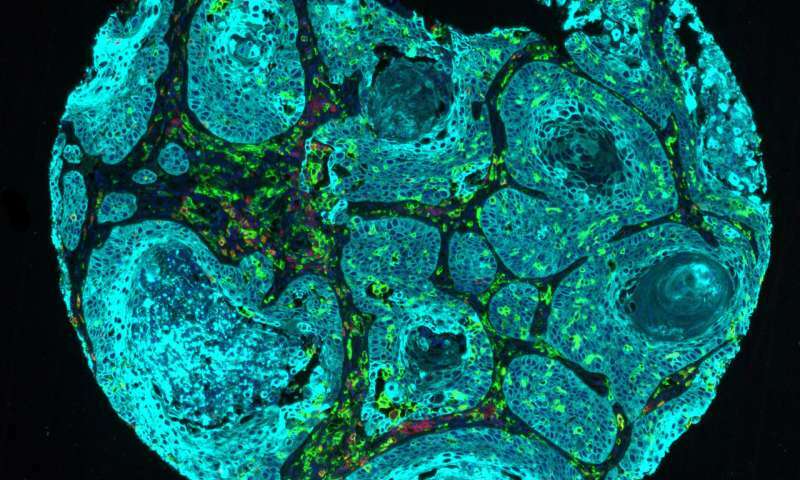 "It's important to understand that while there is so much focus on activating parts of the immune system to attack cancer, there is also a 'Jekyll and Hyde' process going on in most tumors," Pecot said. "There are immune cells we want to activate, but there are other immune cells we want to turn off." The researchers used newly developed laboratory models of lung squamous carcinoma to study the role of the inflammatory monocytes. The tumors make a signal called CCL2, which helps to recruit inflammatory monocytes. These immune cells then release a clotting factor, Factor XIIIA, which Pecot said creates a fibrin scaffold that tumor cells climb across and then travel to distant organs. "These results shed new light on tumor microenvironment functioning and, potentially, may lead to new approaches for targeting the metastases of this extremely aggressive disease," said Alessandro Porrello, Ph.D., researcher at UNC Lineberger and the study's first author.By genetically modifying the expression of CCL2 in a metastasis model developed in their laboratory, they found low expression was linked to reduced metastases, while high expression was linked to enhanced metastatic features. They also demonstrated that the presence of a clot made it easier for cancer cells to move and migrate. Also, when looking at tumor samples from patients, they found that tumors with high amounts of the fibrin cross-linking was associated with an increased risk of the tumor spreading. The researchers were able to reduce metastases by using a compound that blocks CCR2, a receptor on the surface of the inflammatory monocytes. They saw a significant decrease in lung metastases. Pecot said they want to continue investigating this strategy, and potentially other ways of preventing clotting within tumors, to see if it prevents metastases from initiating and whether it can stall the process once it has begun. "We want to make progress for patients with lung squamous carcinoma and expand the therapeutic options available to these patients," Pecot said. "The more we understand the progression of the disease, including how metastases occurs, the more we'll be able to understand how we can regress this disease, or just keep it in check. We believe there are ways we can teach these tumors how to heal."